Kayla: Hi Victoria, I really appreciate you taking the time to stop by Bibliophilia, Please for your blog tour! Do you mind telling us a little bit about yourself? Victoria Strauss: I write for both adults and teens--nine books so far. My first love is fantasy, but I also write historical novels. My two most recent books, Passion Blue and Color Song, are YA historicals with a touch of magical realism. I'm also co-founder of Writer Beware, a unique anti-fraud resource that educates writers about the many scams and schemes that target them, and about the publishing industry in general. When Writer Beware started up in 1998, we hoped we'd eventually put ourselves out of business--but the growth of self-publishing and small press publishing over the past 10 or 15 years has given birth to a whole new range of scams. Writer Beware is busier now than it's ever been. What else?...I'm a fanatical gardener, a bit of a health nut, a voracious reader and movie buff, and I spend way too much time online. Kayla: Since your book Color Song, and the previous book about Giulia, Passion Blue, seem to be very art-centered, I have to ask – are you an artist in addition to being a writer? Victoria: I wish! I can barely draw stick figures. But I've always loved art and painting. I loved going to museums when I was a child, and in college I took art history courses. I've long been fascinated by the handful of female artists of the Renaissance, who managed to forge careers in spite of the rigid conventions and prejudices of their time, but who were almost forgotten in the centuries that followed. Those courageous women inspired both Passion Blue and Color Song. Kayla: Does the reader need to read Passion Blue first, in order to understand the events in Color Song? Victoria: I wrote Color Song to stand alone. There is backstory, but it's incorporated into the narrative so the reader doesn't get lost. So yes, you can read Color Song without having read Passion Blue--though of course reading Passion Blue first would add to the enjoyment. Victoria: It's almost impossible to choose! 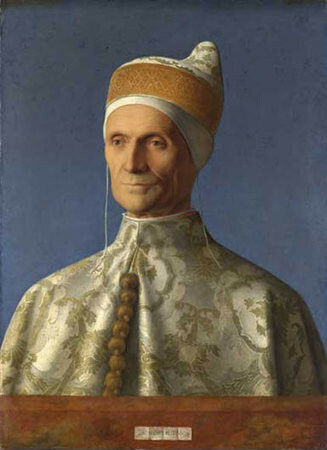 But I think it would have to be Giovanni Bellini's magnificent portrait of Doge Leonardo Loredan, painted in Venice around 1501 (link to image: http://venicewiki.org/images/f/f0/Bellini_-_Leonardo_Loredan.jpg ). It's almost photo-real, and yet clearly a painting, with its beautiful blue background. The Doge's face is both commanding and serene, and every detail of his sumptuous brocade robe is clear. Bellini was the most famous Venetian painter of his time. He makes a brief appearance in Color Song, as the judge of a painting contest Giulia hopes to win. Kayla: What is your favorite distraction when you’re writing? Victoria: Almost anything, really! I'm a highly distractable writer, and a major procrastinator. The biggest pitfall for me is the Internet. If I get stuck on a difficult scene, or if I'm having a problem figuring out what comes next, or if I need a bit of spot research, it's way too easy to go online and get lost there. When I'm writing, I use a program called Freedom that blocks Internet access for a pre-determined amount of time. It's a big help in keeping me on track. Kayla: Which books or authors or artists would you say have affected or inspired your work the most? Victoria: That's a tough one! Growing up, I loved Susan Cooper, T.H. White, Anne McCaffrey, Ursula Le Guin, Madeline L'Engle, Andre Norton, Lloyd Alexander, Rosemary Sutcliffe, and so many more. When I got older I discovered Samuel Delany, William Golding, and wonderful historical writers like Cecilia Holland and Robert Graves. I don't think I could pick one, or even two or three, that had the most influence; all of them have touched my writing, and all have inspired me to try to write as passionately and as well as they do or did. Victoria: Brandon Sanderson's Words of Radiance, the second installment of his Stormlight Archive fantasy series. It's going to take me a while to finish--it's over 1,000 pages. I love big books. Victoria: The Rule of Thoughts, Book 2 of James Dashner's Mortality Doctrine series. Dashner writes great adventure stories. Victoria: I'm working on a YA fantasy that doesn't have a title yet (I'm superstitious about titles--I don't usually decide on them until a book is nearly done). It's about Celine, the adopted daughter of a professional poisoner, who has been trained by her father to tend his garden of lethal shrubs and flowers. One night a thief climbs over the walls of their isolated mansion to plunder their wealth--but as he attempts to escape he's poisoned by one of the deadly plants. Celine finds him and saves him. She also finds that among the things he has stolen is a box her father never allowed her to open. Inside is a secret about her birth that makes her and the thief unlikely allies, and launches them on a dangerous quest.